It was another great night at SkunkMonk and a big thanks to Ric and all the team that helped make it possible. The 360˚ Panorama Video presentation was exceptionally well received with a lot of interest in the technology and how it can be applied. 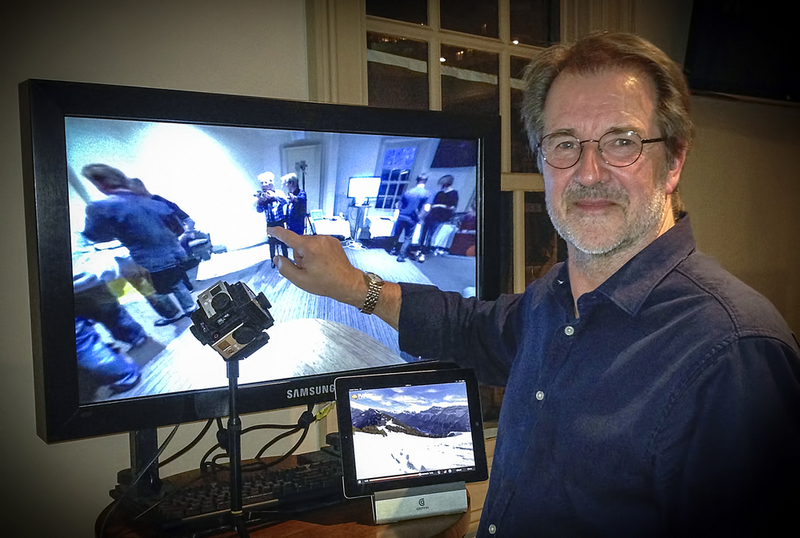 Demonstrating a 360˚ Panorama video, shot on location using the touchscreen to control the movement of the video. In the photo above you can see the Freedom360 rig, holding the 6 GoPro Cameras, that was used to shoot the video. The video is playing in the Kolor Eyes desktop app while in front I've got an iPad, also running the Kolor app for iPad, showing additional 360˚ Panorama Video. Here's an interview shot on the evening, I've been asked to describe what I do in 30 seconds. A big thanks to the guys at Hire Intelligence who jumped through hoops to get me the Samsung Touchscreen, it was definitely worth it. If you are free on Thursday the 22nd of August and would like to check out some of the latest 360˚ Panoramic gear including a new 360˚ GoPro Rig from Freedom360 and panoramic video stitching software from Kolor make sure you come down to SkunkMonk at the Harlequin Inn, 152 Harris St, Pyrmont between 5:30pm and 8:30pm.